You'll receive this task from Medreth in Dyrford Village (#1). Medreth will tell you that he's looking for a well-known murderess named Nyfre, and that she's supposed to be somewhere in Dyrford Village. However, he'll add that she knows what he looks like, and so he'll ask you to lure her out so he can deal with her "cleanly." 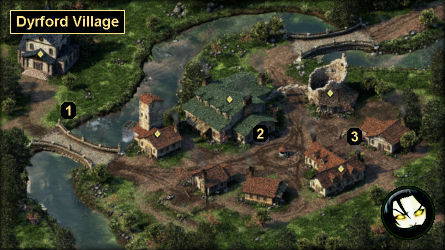 If you question the local villagers, then you'll learn from Hendyna (#3) that Nyfre is hiding in the Dracogen Inn (#2). You can attack Nyfre and her entourage. It's probably easier to do the fighting in the hallway rather than in the room where they're staying. When you loot the bodies, you'll find the unique medium armor Night-Runner on Nyfre, plus a few "fine" items on the others. Then when you return to Medreth, he'll give you 1000 cp, and you'll earn a "minor" reputation bonus with House Doemenel in Defiance Bay. At the end of your conversation with Medreth, he'll admit that Nyfre didn't really kill anybody. If you attack him for lying to you, then afterwards you'll find several "fine" items on the bodies, plus another 1000 cp on Medreth. But you'll take a "minor" reputation penalty with House Doemenel. You can lie to Nyfre and send her to Medreth. This will require you to have Resolve 16. Nyfre will pay you 750 cp for the "help," and when you return to Medreth, he'll reward you with an additional 1000 cp. You'll also earn a "moderate" reputation bonus with House Doemenel in Defiance Bay. You can tell Nyfre the truth about Medreth (or try to lie and fail). Nyfre will pay you 750 cp for your assistance. Then when you return to Medreth, you'll have two options. If you tell him the truth, then he'll attack you, and you'll take a "moderate" reputation penalty with House Doemenel in Defiance Bay. If you lie to him, then you'll need to have Resolve 14 to be convincing. If you're successful, then he'll give you 1000 cp, and you'll earn a "minor" reputation bonus with House Doemenel. Otherwise, he'll attack you, and it will be like you told the truth.